After losing Carson Palmer for the season there are questions about whether or not the Cardinals – who have a two-game lead in the NFC West – can still make a Super Bowl run. Answer: Yes, because their defense is playing championship football. News broke Thursday that Arizona’s defensive coordinator Todd Bowles had his contract extended through 2017. His defense is playing as well as any in the NFL despite having to make personnel adjustments all season due to injuries and suspensions. The Cardinals’ defense is ranked fourth in the NFL, allowing opponents to score only 18.9 points per game. Their rush defense is ranked third and has made opposing offenses virtually one-dimensional by holding them to only 78.6 yards per game on the ground. Most importantly, though, the Cardinals’ defenders are takeaway machines. Arizona’s defense leads the league with 14 interceptions. They have been complemented by an efficient offense, which has only thrown three interceptions and lost four fumbles. That puts them at a plus-12 turnover margin, tied with New England’s for the league’s best. GM Steve Keim’s abilities of evaluating, locating and acquiring talent to fill out his roster have become further exposed as the backbone of the winning organization that Arizona has become. If Drew Stanton can simply protect the football and let his defense continue to play as well as they have, the old saying "defense wins championships" may be a mantra and reality in Arizona by season’s end. Let’s take a look at some of what makes Arizona’s opportunistic defense so good at snagging interceptions. 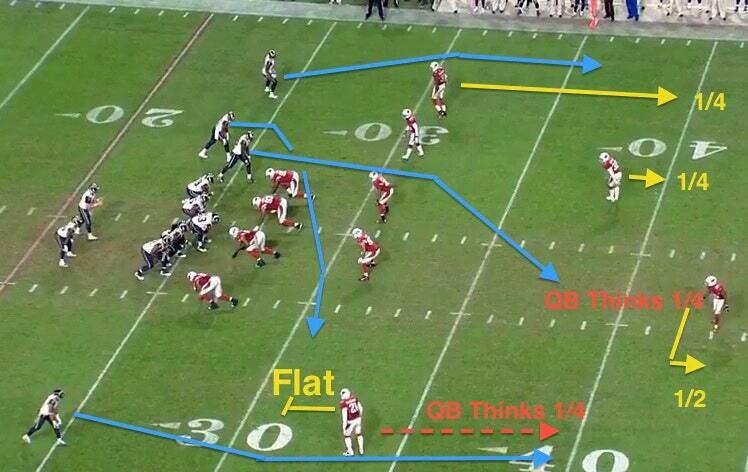 Arizona’s cornerbacks — Patrick Peterson and Antonio Cromartie — make a dynamic tandem. Aside from their coverage skills, the fourth- and ninth-year pros have a great understanding of how to confuse opposing quarterbacks and have become two of the league’s best when it comes to the art of disguising coverage. It’s not easy. 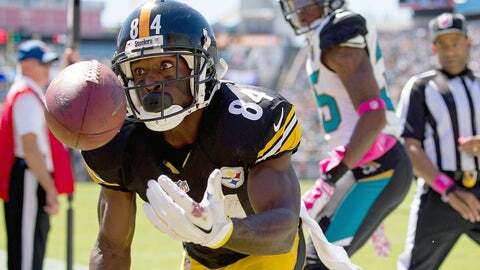 Many defensive backs either tip their hand too soon — giving the quarterback an easy read — or they get caught out of position and end up getting burned on plays where they disguise too long. In the first photo you’ll see that the secondary is showing quarters coverage across the board, when they are actually playing quarters only to the top of the field and Cover 2 at the bottom. The key is Peterson to the bottom of the screen, where he is aligned eight yards off of the receiver instead of tight like he should be in Cover 2. The quarterback’s pre-snap read is that Peterson will be deep instead of lurking in the flat like where the latter ends up. In the next photo, you can see that the quarterback has clear-out routes across the board, except for the receiver dragging shallow across the field. Peterson is still back deep to disguise his actual coverage zone, but he keeps his eyes on the threat to his zone and on the quarterback to get a read and a jump on the ball. In the next photo you can see that Peterson got exactly what he wanted — the quarterback took the bait and threw the pass where he thought there would be a void. 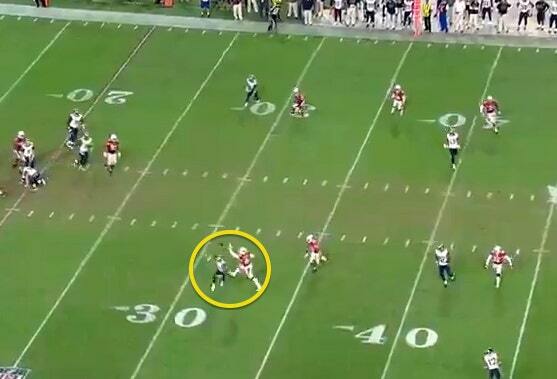 Peterson jumped on the opportunity, tipped the pass to himself and then took it to the house for a touchdown. Many of the Cardinals’ league-leading 14 interceptions have come off of straight up man-to-man situations. The defensive backs’ coverage skills are as good as any group in the league. Safeties Rashad Johnson and Tyrann Mathieu have three combined interceptions, while cornerbacks Cromartie (3), Jerraud Powers (3) and Peterson (2) have eight combined thus far. The defensive backs simply smother opposing receivers in man-to-man situations and do not give quarterbacks a large target radius — especially when they operate out of press coverage. 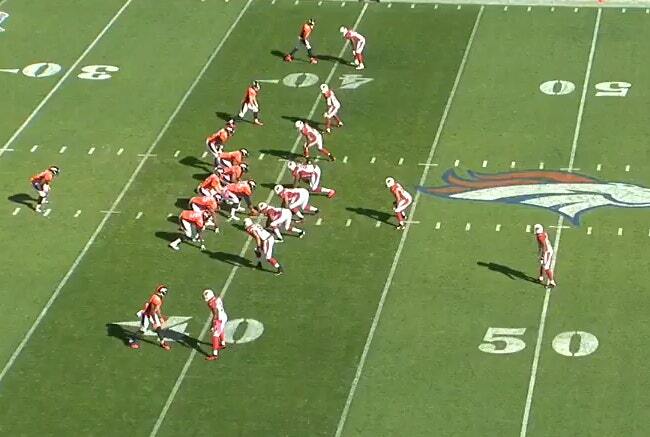 Check out these shots of Cardinals defenders in coverage against the Broncos. In the first photo, notice that everyone is in press coverage. This is where they really excel. In the next photo, notice how tight the coverage is long into the down. 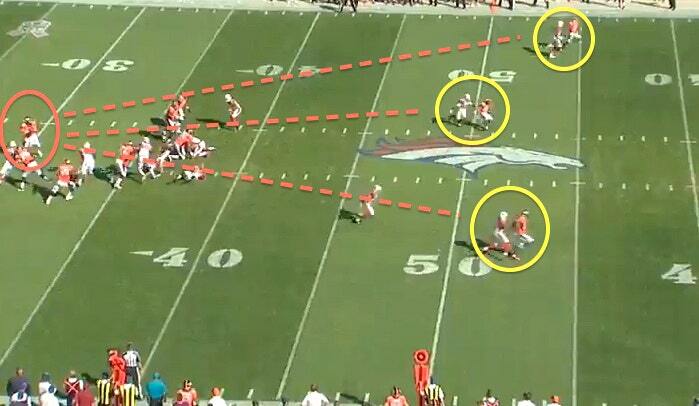 Peyton Manning scans the field thinking that at least one of his receivers would shake his man and get open. 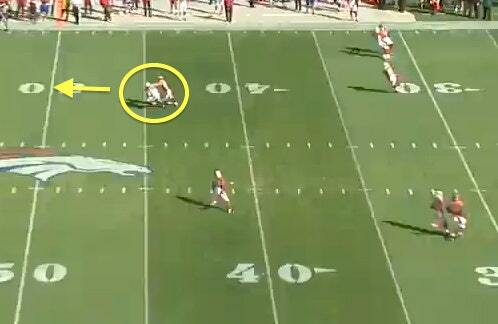 Finally, you can see the poor decision that Manning made on this down. It’s a perfect example of the frustration that has set in for many quarterbacks who’ve faced this defense in 2014. At some point, a quarterback (even one of the all-time greats) will try to force something that isn’t there when they face a defense that is so outstanding in man-to-man coverage like Arizona. The Cardinals have capitalized often this season and that’s why a majority of this secondary’s interceptions have come in the second half of games. This Sunday’s matchup will be a treat to old-school football fans who love defense — the Detroit Lions are also one of the best in the league. As you watch the matchup, notice how Arizona’s secondary works the art of the disguise to confuse Matthew Stafford. Stafford has thrown four interceptions (half of his season’s total) in his last three games. 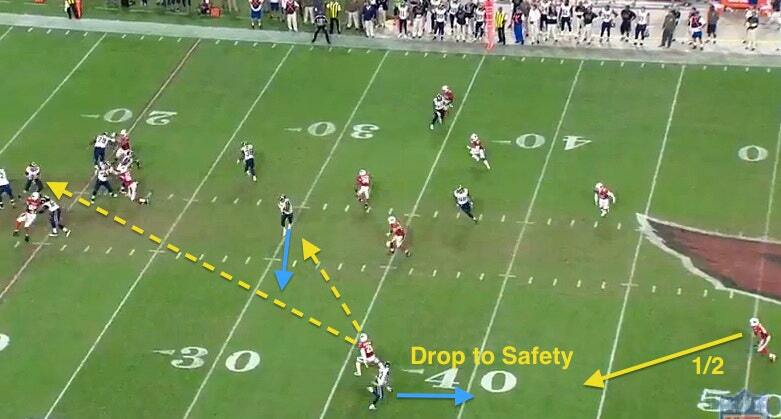 Also, take note of how tight Cardinals defensive backs are able to play in man-to-man coverage. They are playing at a level that is second-to-none right now, and they are the reason the Cardinals continue to make an impressive push into the playoffs. And yes, the Super Bowl is still on the table.